Introducing…shupg » NA0046 – Whee! Paris! Feeling in the mood for a Paris holiday? 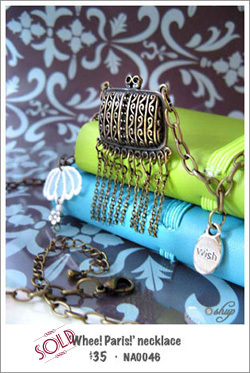 Pack your bags and off you go with this whimsical necklace! Quaint embroidered lace parasol with a pewter flower handle, plus a tiny “wish” charm, you can now whisper your desire quietly and it may just come true!